Prayer is the act of lifting our eyes to the LORD to see goodness in the land of the living (Psalm 27:13), looking to His hand to satisfy every good thing (Psalm 145:15-16), ushering in His kingdom and His will (Matthew 6:10), facing East awaiting that final Sunrise when He will come in glory and shine on us (Malachi 4:2). Understanding invites us to open our eyes wide and behold the direction of the wind (John 3:8), to watch an infant’s chest rise and fall, and take in the beauty and the spectacle of our very existence (Psalm 139:14). Understanding resembles the phenomenon of sight—the ability to invert our stark outlook on this violent world and comprehend the meaning and majesty before us (John 1:5). Resolve is to choose again, day after day (Joshua 24:15), that we will fix our eyes on Jesus and things above (Colossians 3:2)—things that are true, honorable, just, pure, lovely, commendable, excellent and worthy of praise (Phillipians 4:8). Resolve does not merely give a cursory glance to the things of God, resolve commits to seek His face and hold His gaze (Psalm 105:4). Engagement is when we reach out our hands based on what we have seen (Philippians 4:9). It is when we put feet to our faith and reflect His light to others (Proverbs 27:19). Engagement is the outcome of all the others—it sees and then it loves. It compels us to speak for the cause, lend to the needy, assist the distressed and lift the lowly. And then it causes us to return again to prayer. 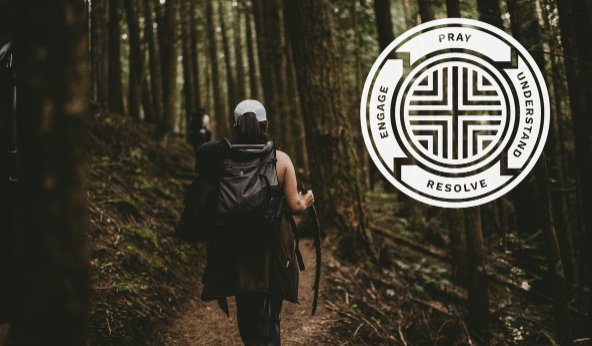 We call this the “pure” loop—first a handy acronym, but more significantly a loop, because it never ends, only perpetuates our ongoing pursuit of God’s love, purity and justice. A cycle that creates a lifestyle. This is the rhythm of everything we do here at pureHOPE. We hope this post is a breath of fresh air and an encouraging reminder to let this same rhythm guide you! For more like this, check out our lifestyle magazine, A World Free.